Searching for a new vehicle? You want to find a model that fits both your needs as well as your budget, not to mention has enough space inside for all your gear. Hatchbacks are a great option for drivers who are looking for a vehicle that gets great fuel economy but also has some extra cargo space for hauling your things. 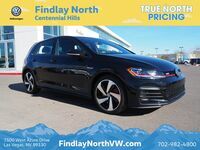 The 2019 Volkswagen Golf GTI is a classic hatch that has the power and efficiency that drivers want. One of the options that drivers can choose from is the Golf GTI Rabbit Edition. This version of the Golf GTI brings the classic back to life. Besides the Rabbit Edition, the 2019 Golf GTI is also offered in three other trim models. Continue reading to learn about the trim levels of the 2019 VW Golf GTI or click on the button below to view our current Golf GTI inventory! The 2019 VW Golf GTI has plenty more features to offer. If you are interested in learning more about this hatch from Volkswagen, be sure to click on the button below to receive more information!